A search has begun for the owners of a hamster found in a North Yorkshire rubbish bin. Street cleaner Alan Gregg spotted the small rodent when he was emptying the bin in Bullamoor Road, Northallerton. Mr Gregg said the hamster, nicknamed Hammy by staff at the council depot, was hiding at the bottom of the bin and was "very frightened". "With a bit of coaxing I managed to get him out of the bin and carried him back to the depot," he added. Staff at the Hambleton District Council depot found a temporary home for the hamster at a Northallerton pet shop. 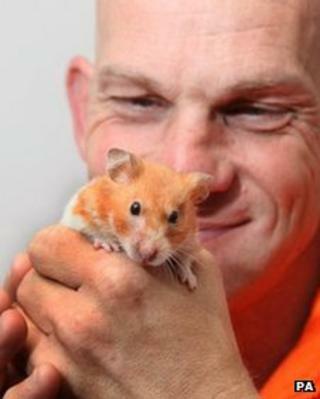 If no-one comes forward to claim him in the next few days Hammy will be found a new home.